The 21st Giver's Gift promotion returns to Lakeview for anyone who spends $300 at local stores. "Creating this store ... with my co-workers has truly been my pleasure," owner Pamela Hewett said. The businesses within the 111th Street shopping district will again distribute candy and treats. The Halloween superstore, 4065 N. Milwaukee Ave., will stay open 24-hours until 9 p.m. Tuesday. Christkindlmarket Boot Mugs Through Time: Which One Is Your Favorite? Chicago loves Christkindlmarket mugs. Here is each one going back to the first festival in '96. "The idea was do something a little different from the normal skull-and-crossbones," its founder said. 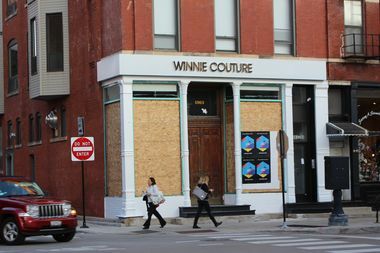 A launch party is set for 11 a.m.-7 p.m. Saturday at Humboldt House, 1045 N. California Ave.
From shopping events to drag performances, Lakeview has a little something for everyone this weekend. The new gallery represents the next step in business for Metal Magic Interiors and Norman Leigh Design. The new riverfront Apple store opens Friday off Michigan Avenue. Here's a sneak peek. The protest planned at Park Pet Shop last weekend was rescheduled because of storms. The axe throwing club will be right on the border of Lincoln Park and is planned to open in December. No, it's not Amazon's new second headquarters just yet, Chicago.